Over the years, the Impulse Model of the Impulse NGO Network has been featured in many articles and news reports, in India and across the world. Featured below, are links to some of the articles mentioned above. 05 Oct, 2017: For 17-year-old Kate Lam (name changed) the offer for a job in Singapore seemed the best chance to escape the poverty of her home at Churachandpur district in Manipur. The minor, however, had no idea that she would become a victim of an international trafficking racket and would be sent illegally to Myanmar to be flown later to Singapore to work as domestic worker. 10 Mar, 2016: Hasina Kharbhih created the internationally acknowledged Meghalaya Model, a comprehensive tracking system that successfully brings together the state government, security agencies, legal groups, media, and citizen groups to combat the cross-border trafficking of children in the porous Northeastern states of India. To read the full article in Ashoka SV Innovation Exchanges, please click here. 29 Jan, 2016: Human trafficking is an alarming threat that the country is facing in the present context and Nagaland does not provide with a different picture with a rise in demand for domestic helpers and cheap labours in the state which shares its borders with so many states and a country. To read the full article in Nagaland Page, please click here. 29 Jan, 2016: Nagaland Police joined hands with Shillong based ‘Impulse NGO Network’ an anti-human trafficking non-profit organisation to combat human – trafficking through the use of new technology called the “Impulse Case Info Centre Software”. To read the full article Eastern Mirror, please click here. 07 Jul, 2015: The Meghalaya Model in “combating child trafficking through networking in Northeast India” which evolved after Impulse NGO Network conducted a need assessment study to understand the basic issue that needs intervention needs to be replicated in the entire Northeast. To read the full article in Tehelka, please click here. 02 Jul, 2015: Punjab Government adopted the Meghalaya Model to curb child labour under which provisions will be of Rs 20,000 as fine and three months imprisonment to offenders. A meeting under the chairmanship of Sukesh Kalia, Chairman, Punjab State Commission for the Protection of Child Rights was held. To read the full article in Business Standard, please click here. 02 Dec, 2014: Hasina Kharbhih has created the Meghalaya Model, a collective initiative involving government, NGOs, judiciary, police etc which work in close collaboration to tackle human trafficking in northeast of India. To read the full article inThe Assam Tribune, please click here. 20 Oct, 2014: Impulse Model which is earlier known as Meghalaya Model addressed trafficking of women and children and look after the 5 R’s and 5 P’s. Impulse Model won second place in the world to fight crime related to human trafficking. It’s also replicated by Bangladesh, Myanmar and Nepal. More of the migrate people who were the victim of human trafficking, migration has happen because people are looking for the economic opportunities outside. Migrate people having some traditional skills which is not as high as skill that anybody would be coming from good background and also not income generating. Impulse Model helps these people in channelizing the ongoing business and also feeling proud what they have. Impulse Model helped in preventing trafficking in this way. To read the full article in Eastern Sky Media, please click here. 12 Sep, 2014: “The northeast need a strong identity to bind it and I believe art and craft could be the answer” –Hasina Kharbhih. As part of the Impulse NGO Network, Kharbhih’s team came up with the UN certified Meghalaya model (now called Impulse model) for human trafficking intervention. The model helped direct efforts towards communities that needed aid the most, helping agencies such as the government or United Nations office on Drugs and Crime (UNODC) chip in for every specific roles. Started by Shillong resident Hasina Kharbhih in December 2010 with initial investment of 10 lakhs, ISE works to prevent unsafe migration and human trafficking by providing communities in northeast India a livelihood in their own neighbourhood. Kharbhih brought ISE to life, marketing handloom products made by artisans in all eight states under Empower brand. “About 60% of Indian’s population is in rural areas and at these locations women are limited to their homes. If we can give these women the opportunity to work from the comfort of their homes, they don’t need to travel to cities to look and land up in exploitative situations. The northeast needs a strong identity to bind it and I believe art and craft could be the answer. It’s even better if its helps unsafe migration” Kharbhih said. To read the full article in Outlook Business, please click here. STAYING SAFE IN CONFLICT ZONES: ADVICE FROM FEMALE SOCIAL ENTREPRENEURS. 18 Jun, 2014: As the founder of Impulse Social Enterprises and Impulse NGO Network, which provides livelihood opportunities for vulnerable communities affected by human trafficking in North-East India, she has faced several death threats and has been assaulted in front of a local court when fighting a case. Hasina Kharbhih Founder Impulse NGO Network has developed the “Meghalaya Model” which has helped change the lives of more than 20,000 local women artisans. 29 May, 2014: The Meghalaya Model, created by Impulse NGO Network, is a multi-sector approach involving government, law enforcement, judiciary and civil society organizations that creates a comprehensive framework for combating human trafficking of girls under the five “Ps”: Prevention, Protection, Policing, Press and Prosecution. The model’s different initiatives aim to track and rescue trafficked children, facilitate rehabilitation, provide families with livelihood alternatives, prosecute offenders, and raise awareness on the issue. To read the full article in IDEX, please click here. 29 May, 2014: The Meghalaya Model (now known as the Impulse Model), created by Impulse NGO Network, is a multi-sector approach involving government, law enforcement, judiciary and civil society organizations that creates a comprehensive framework for combating human trafficking of girls under the five “Ps”: Prevention, Protection, Policing, Press and Prosecution. 17 Jan, 2014: The Meghalaya Model was approved by Indian Government and supported by United Nation Office on Drug and Crime and UN women. It is based on five P’s and three R’s. In this Model many stakeholders work together such as law enforcement, Social Welfare, Education, Labor Department, Media, Civil Society, and Judiciary to combat human trafficking. The Meghalaya Model has been enacted in eight northeastern states within the span of 10 years. The model focuses on the involvement and coordination of various government agencies to collectively respond with available resources. 09 Dec, 2013,: The American Center, Kolkata in association with the Impulse NGO Network organized a three day anti trafficking in-persons conclave 3 titled moving forward. Several participants from India, Bangladesh, Myanmar, Hong Kong and New York attended the conclave. During the conclave Impulse Model’s Token of Recognition and Arunachal times were awarded The Impulse Model’s Media Awards for change Maker for their reportage on human trafficking. To read the full article in Assam Times, please click here. 03 Dec, 2013,: Hasina Kharbhih is the founder, president and presently the team leader of Impulse NGO network, a social organization working on issues of child trafficking, HIV/AIDS intervention and livelihood support initiatives for rural Northeast India. Meghalaya Model addresses the issue of child trafficking and this system brings together the state government, police, legal support, the media, and NGO’s working together to bring about systemic change. This model is effective in combating child trafficking with the help of four P’s and the three R’s by law enforcement agencies and civil society. This model is now implementing in eight states of north east. To read the full article in Lokvani, please click here. 26 Jun, 2013,: To provide a long lasting, holistic solution to rampant human trafficking problem, Impulse has created the Meghalaya model which not only rescues, rehabilitates and reintegrates victims of human trafficking but also overseas prosecutions of the traffickers and raises awareness to prevent human trafficking. What makes the model special is its ability to get various stakeholders involved. “We understand that the issue of human trafficking is too big to be handled only by a few NGOs. The government agencies and other stakeholders have to involved” says Hasina Kharbhih. To read the full article in GLOBAL DEVELOPMENT NETWORK, please click here. 06 May, 2013,: The Impulse NGO Network team developed the internationally recognised Impulse Model to comprehensively address the root causes and persistent challenges of human trafficking. The Impulse Model is now being adapted by many countries all over the world. According to Hasina Kharbhih to address human trafficking problem holistically, she and her team decided to work with the legal process. There are five P’s- Prevention, Protection, Press, Policing, Prosecution and five Rs — Reporting, Rescue, Rehabilitation, Repatriation, and Reintegration. After reporting a rescue done by police the next process of Rehabilitation, but it is short term. Next process is repatriate after that help the victim to Reintegrating in the society. Indian laws are not sensitive to human trafficking, it is not prostitution and need to sensitive than any other crime, that’s why five Ps came out which focuses on training and capacity building for law enforcement. Human trafficking is a crime and prosecution will take place for it. Media helps in raising funds to encouraging prevention, protection after rescue. So training programs an important part of the model. To read the full article in Asian Philanthropy Forum, please click here. 02 Apr, 2012: Impulse Case Information Centre database, Meghalaya has been declared as semi-finalist by Global Development Network (GDN), as the most innovative Development initiative an international recognition. Impulse Meghalaya model is a comprehensive method to address the problems of human trafficking from different aspects, engaging stakeholders to work in a collaborative network. The aim of the model is to track and rescue trafficked children to facilitate rehabilitation, provide families with livelihood alternatives, to prosecute offenders and raise awareness. These activities translate to the pillars of Meghalaya model which are five “Ps” prevention, protection, policing, press and prosecution and five “Rs” reporting, rescue, rehabilitation, repatriation and re-compensation. The model has also received further recognition as a good practice by UNDP in 2007, Ashoka in 2006 and government of India where it is in draft to become a national model. 29 Oct, 2011: Ms. Hasina Kharbhih Founder Impulse NGO network was nominated as a Ashoka Fellow for her work in developing a holistic approach to combating inter –state and cross –border child and human trafficking called the Meghalaya Model. This Model was chosen as one of the top three in the world at the 13th Annual Global Development Conference in 2011. To read the full article on Tulsa Global Alliance, please click here. 20 Feb, 2011: To combat human trafficking and rehabilitation of victims, Impulse NGO Network has simplified the law and compiled, into a handbook, which has been adopted by police training school across the northeast. The handbook simplified laws. It’s also talk about how to prevent human trafficking and the investigation process and alternative strategies to combat menace. To read the full article on Thaindian News, please click here. 02 Sep, 2010: The Meghalaya model is a multi sector approach involving government, law enforcement, judiciary and civil society organizations that creates a comprehensive framework for combating trafficking of girls under five “Ps” prevention, protection, policing, press and prosecution. This idea addresses under utilization of resources by different stakeholders by creating a formal network of organizations situated in strategic locations to co-ordinate a response to human trafficking cases within North East region. The models different initiatives aim to track and rescue children trafficked, facilitate rehabilitation, provide families with livelihood, alternatives, prosecute offenders and raise awareness on the issues. To read the full post in Ashoka (Change Makers), please click here. 31 Oct, 2009: According to Ms Hasina Kharbhih tehe leader of the Shillong based Impulse NGO network ‘with an estimated 30 million trafficked in South East Asia during the past ten years , the Centre’s Look East Policy will be more vulnerable to human trafficking in the north eastern region. The programme was organised by Impulse NGO network in collaboration with Arunachal Times (media partner) , Athupopo Social Foundation (State Partner) and supported by UNIFEM (United Nations Development Fund for Women). The objective of the programme was to encourage greater print media publication of human trafficking and building the capacity of journalists on the issue of human trafficking. Inter trafficking in India is very high for labour 23 percent and for sexual exploitation 77 percent is being done in India. Almost half of the child prostitutes were from the north east region and were sold to the brothels in Mumbai , Pune and Ahmedabad. Editor of the Arunachal Times Audrey Apang emphasized for the need of sensitized media , police and NGO to address human trafficking. Lack of awareness is the main reasons for the exploitation and human trafficking. To read the full post in The Arunachal Times, please click here. 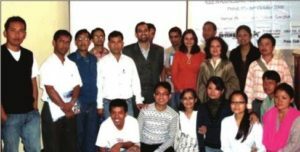 09 Oct, 2009: A capacity building workshop for local journalists on their role in addressing issues related with human trafficking with Shillong Impulse NGO network and Sikkim Express in association with the Press Club of Sikkim (PCS). The representatives of Human Rights Law Network (HRLN) Sikkim unit and HOPE NGO have been roped in as resource persons for the workshop supported by UNIFEM. related with human trafficking and other allied social menaces. She also highlighted the global issue of human trafficking which comes in various forms luring millions of women and children in forced slavery and sexual exploitation. HRLN Sikkim chapter director Dr. Doma Bhutia also briefed the media in various legal and constitutional parameters related to human trafficking during the workshop. PCS President Paramani Danga spoke on the media response to reporting on social issues with special reference to human trafficking. To read the full post in Sikkim News, please click here.